Just as any other electronic device, printers also have evolved enormously to sync with the technological advancements and user requisites. If you are willing to upgrade your old printing device or you’re getting started in home printing, this article can be a useful piece for you. 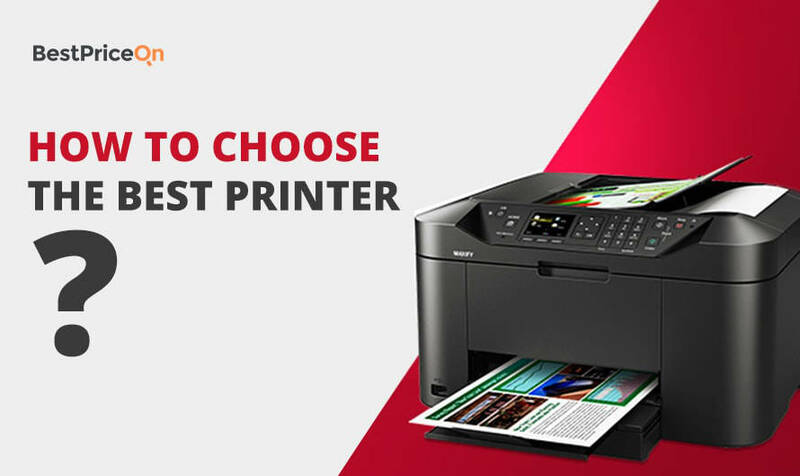 For, we bring to you an elaborate post on printer buying guide – how to choose the best printer. Use this printer guide to understand the different types of printers, their avant-garde features, and which one suits your requirements. This is the main purpose of this article. There are a variety of factors on which a user would choose a printer. However, we have come up with a list of generic guide lines that will help any user choose a printer on the basis of their need and budget. Let’s not scare you, but the types of printers available in the market can be overwhelming. However, by answering those two questions, you can pretty much figure out which one to choose, from the types of printers available. Are you looking for the best printer for home use on the internet? Then, you’re at right place! 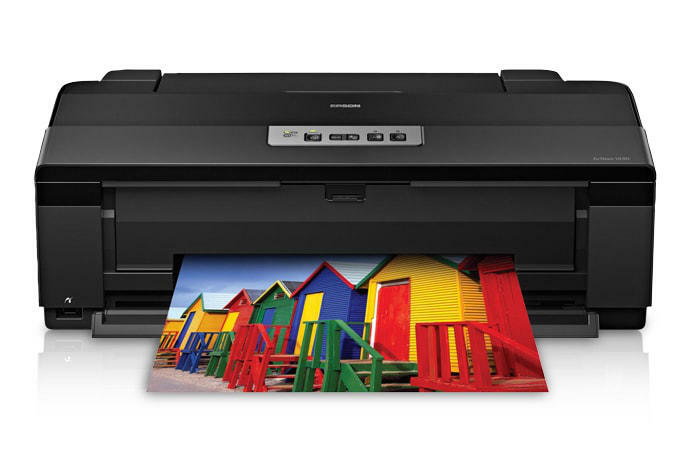 The first question that you should ask yourself is – Do I want a dedicated printer or an All-in-one printer? A dedicated printer or regular printer is the traditional printing device that only prints without offering any additional services. Multifunction printers (MFPs) offer additional functions like photocopy, scanning, and faxing. They are available in inkjet and laser versions, thus making these types of printers perfect for home, offices, and small businesses. 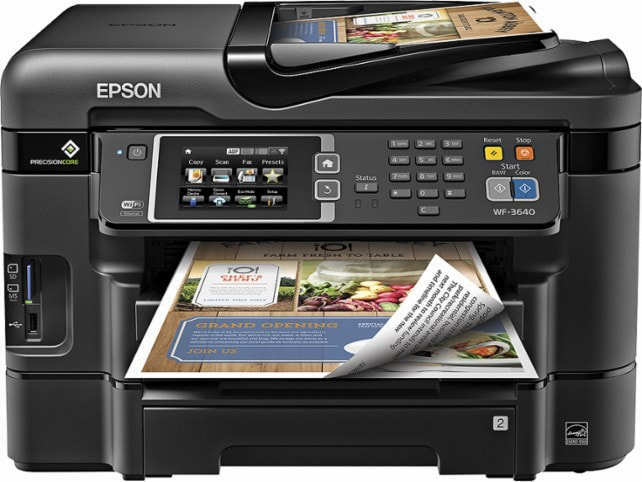 These all-in-one printers also come equipped with auto duplexers that let you save money on double-sided prints, and auto document feeders for walk-up scanning, fax, and copying multipage documents. 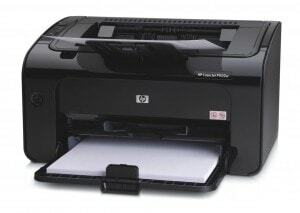 The second question that you should consider asking is – Do I want an inkjet printer or laser printer? Both of them have different functionalities. While inkjet printers use liquid ink sprayed through microscopic nozzles onto the paper, laser printers, on the other hand, use a toner cartridge (filled with fine powder) and a heated fuser. Let’s go through both of them in detail. Inkjet printers have come a long way since the past decade. Today’s advanced inkjets can produce both crisp text and high clarity photo prints. In the market, you’ll get both general-purpose and photo inkjet printers which you shouldn’t confuse with photo ones that print photos only of 4-inch x 6-inch or smaller sizes. Inkjets print a photo by applying a precisely controlled stream of tiny ink droplets from one or more cartridges to a variety of paper types. Different companies use modified techniques. The Size of the droplets vary along with the way they are applied onto paper, and the software algorithms used for color mixing that determine the image quality also vary. Document printer – These types of printers can fulfill your basic requirements like printing basic documents such as Word document, Excel spreadsheet, Web page, E-mail message etc. both black and white and colored. The inkjet printer is the least expensive of the three types. Photo printer – If the majority of your work requires you to print photos up to 8×10 inches in size, usually high resolution then the photo printer is the best option for you. These are designed to print relatively high-resolution photos that look good as a photo is developed and printed by a professional photo printing business. All-in-one inkjet printer – If your requirement is more than just printing documents and photos then this all-in-one printer can be an ideal choice. These types of printers may also have fax facility and built-in document feeders, thus enabling the user to copy a multi-page document. Hewlett-Packard had launched the first ever LaserJet in 1984 and ever since laser printers have come a long way. Induced with smart technology, they offer faster print speeds, sharp output, and are also cost effective. These types of printer use a photographic drum to access electrically charged toner and then they transfer it to paper, where the image is fused using a heated roller. The cheaper models are usually monochrome i.e. black and white. If your requirement is only of printing text and designing simple graphics then this budget friendly printer can be your thing. If your requirements involve printing documents like a Word document, Excel spreadsheet, or a web page then the basic laser printer can be an ideal choice. The cheapest models in this category are available in black & white. There are also color laser printers, but they come with a higher price tag. And if your requirement is more than just printing a document like making copies of documents and scanning, the All-in-one laser printer is a good choice. Like the basic laser printer, the All-in-One versions are available in both black & white and color. 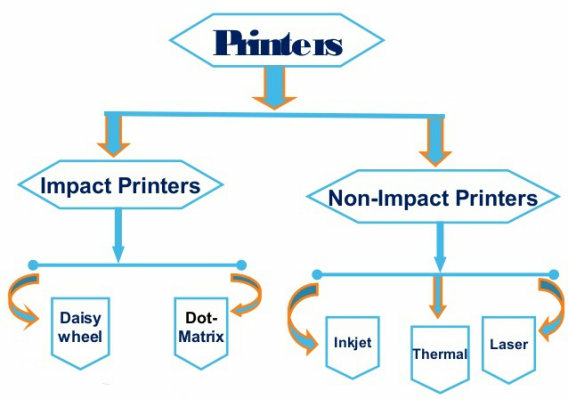 Non-impact printers include laser, Ink-jet and LED page printers and they print without striking the paper, unlike a dot matrix, which hits the paper with small pins. Non-impact printers are quieter and faster than the impact printers. They are comparatively noisy than nonimpact ones but are highly useful for invoices. A dot-matrix printer uses a print head of small pins so as to strike an inked ribbon, thus creating characters or images. They can print about 40-300 characters per second including graphics, however, the reproduction quality is poor. Print-heads are available with 9, 18, or 24 pins; the 24-pin head offers the best print quality. These types of printer use two types of drafts – a crude-looking 72 dots per inch vertically, which is used for drafts of papers and reports and near-letter-quality, a crisper-looking 144 dots per inch vertically, which is ideal for a finished product such as presentation. They are also available in color, where color ribbons are used for limited use of color. 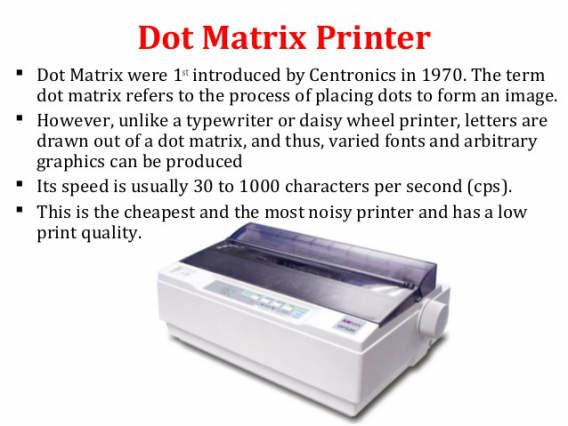 Dot-matrix printers are noisy, affordable and they can print through multipart forms, creating several copies of a page simultaneously. 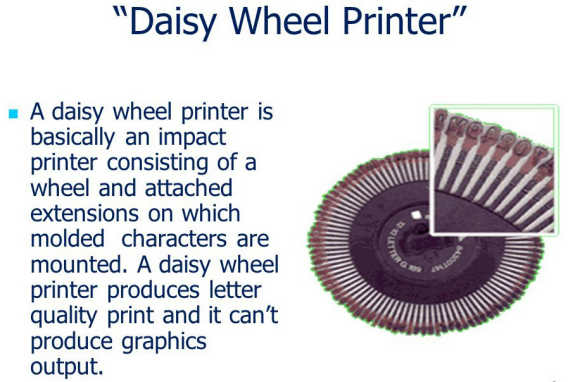 Daisy wheel printer was invented in 1969 by David S. Lee at Diablo Data Systems and is an early type of impact Printer. The printer uses a metal or plastic disk containing each of the letters, numbers and other characters. While printing, the printer rotates the disk to each character and then with the help of a hammer, it strikes each character into an ink ribbon so as to create the character on paper. A daisy-wheel printer works like a ball-head typewriter. You can change the daisy wheel to print different fonts. Daisy-wheel printers, however, cannot print graphics and are noisy and slow. They can print only 10 to 75 characters per second. Ever since the market value of laser and inkjet ones has declined and the dot-matrix printers have evolved, daisy-wheel printers have become obsolete. So those were the various types of printers available in the market to choose from. 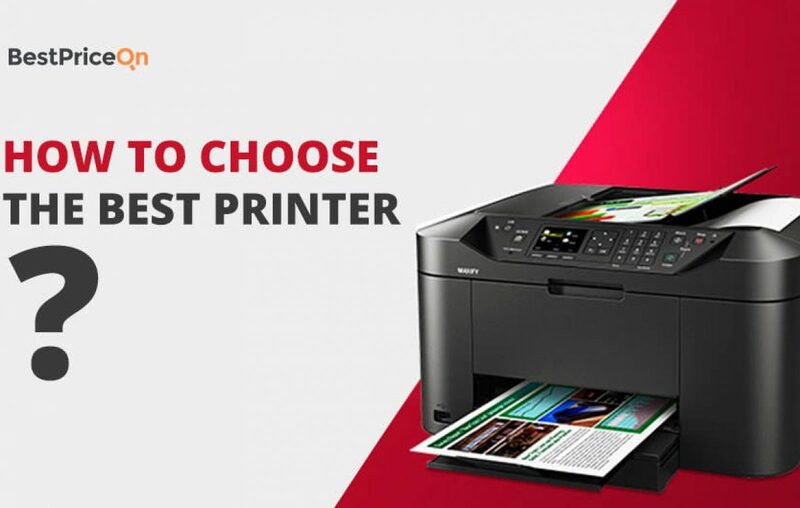 Hope you found this post on printer buying guide – how to choose the best printer useful! OPPO R15 Plus – Is this the new King of the Selfie nation?